Our dolls are so excited! 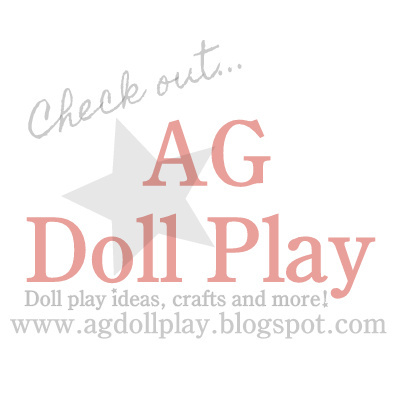 Rumor has it that there just might be a Valentine's Day Doll Party coming! We had so much fun at Zoey and Zoe's Christmas Doll Party that another get together is an absolute MUST! Not sure where the Valentine's day party will be, but we thought we would start to get things ready and share some cool finds. On a quick run to Walmart, I found some very cute little Valentine's stickers and little pre-cut hearts that would be perfect for Doll sized Valentines. They were $0.97 each! Marie-Grace and Julie were hard at work assembling the Valentines. You can see the ribbon we placed between the sticker and the heart to give the dolls a way to hold or hang their Valentines! A close-up of the Valentines. Lily (5 years) and Gracie (8 years) spent about 20 minutes assembling the Valentines without any help! After they layered the pre-cut hearts and added the little words, I suggested adding the ribbon and square sticker to the back. I think these are going to be perfect for our dolls to give to their other doll friends! This is the back side of the Valentines! Kit was so excited to show her friends the heart shaped candy machines she found while out shopping (they were only $1 at Walmart!) Marie-Grace is certain they will make perfect Valentine's Day gifts for their friends! A close-up of the super cute gum ball machines! Kit cannot decide which one she likes best????? Hmmmmm....I wonder what color she will give to Zoe?!?!?! i think she would give Zoe pink!!!!! !